Victorian, Gothic, and so appalling it has to be based on facts. No author would dare to make it up. You cringe and thank the gods we live in an enlightened era. Dorothea is a wealthy heiress, a philanthropist and prison visitor. Kind but verging on the autocratic, her heart is in the right place if her interests are misguided. A follower of the current cult of phrenology, she is thrilled to be presented with a murderer so depraved that a study of her skull should be uniquely rewarding. Ruth is sixteen. Having confessed to the poisoning of her mistress – and others – she is shortly to be hanged. Her history and Dorothea’s current life are told in alternate chapters, the unhappy squalor of Ruth’s childhood, the horrors of apprenticeship, recounted in her conversations with Dorothea. Gradually (it’s a long book) you become aware that Ruth is the protagonist, Dorothea the recording angel, but one profoundly affected by this tale told by a guilt-ridden child. Not so much bad as mad? Juxtaposed with the deprivation of the poor is the luxury of the privileged few who nevertheless have their own sense of insecurity, their own hidden scandals and worse. 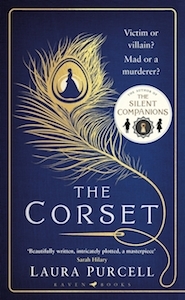 Dorothea’s father is a snob; a widower, he is being wooed by a predacious and vulgar widow who, married, might produce an heir to rob Dorothea of her inheritance: a fortune that is essential since Dorothea’s secret lover is an impoverished constable. This man is curiously two-dimensional; more substantial is the titled landowner who openly courts her, refusing to be rebuffed by her honesty, her sympathy with the oppressed, her frank admission that she is desirable not for herself but her money. This, one thinks, is the man for Dorothea, but the reader is not the story teller; the reader must go back to the prison, to the terrible, terrifying crescendo of abuse in the attics and cellars and the coal-hole - all hidden behind the glittering façade of a Victorian fashion house. In the prison cell phrenology is still apparent, but it’s a pseudo-science now shot through with faint glimmers of the truth. As Ruth talks Dorothea seems to be moving towards an understanding of mental ill-health, working through her interpretation of the size and development of protuberances on the skull towards a glimpse of the mind. She’s getting there but by a different route. There’s a plot and there’s action; suspense is supplied by the approaching date of execution. Other people are dying. Ruth claims her own culpability and expects to die in atonement. She made a corset for herself. She made beautiful corsets as a seamstress. The corset is a representation. You work it out. This is a thoughtful book. You pray for a happy ending, at the very least for resolution. What you get is devastating. Forums will be held to determine what happened. I’m still shocked.